M.N. Beg, M.AZ. Matin, Studies with nickel phosphate membranes: evaluation of charge density and test of recently developed theory of membrane potential, J. Membr. Sci. 196 (2002) 95–102. F.A. Siddiqi, M.N. Beg, S.P. Singh, Studies with model membranes. X. Evaluation of the thermodynamically effective fixed charge density and perm selectivity of mercuric and cupric iodide parchment-supported membranes, J. Polym. Sci. 15 (1979) 959–972. 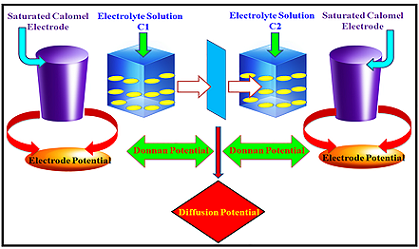 T. Arfin, Rafiuddin, An electrochemical and theoretical comparison of ionic transport through a polystyrene-based cobalt arsenate membrane, Electro. Acta. 56 (2011) 7476–7483. M.R. Khan, Rafiuddin, Synthesis, characterization and properties of polystyrene incorporated calcium tungstate membrane and studies of its physicochemical and transport behavior, J. Mol. Struct. 1033 (2013) 145–153. A.A. Khan, U. Habiba, S. Shaheen, M. Khalid, Ion-exchange and humidity sensing properties of poly-o-anisidine Sn(IV) arsenophosphate nano composite cationexchanger, J. Environ. Chem. Eng. 1 (2013) 310–319. H. Matsumoto, Y.C. Chen, R. Yamamoto, Y. Konosu, M. Minagawa, A. Tanioka, Membrane potentials across nanofiltration membranes: effect of nanoscaled cavity structure, J. Mol. Struct. 739 (2005) 99–104. L. Chaabane, G. Bulvestre, C. Innocent, G. Pourcelly, B. Auclair, Physicochemical characterization of ion-exchange membranes in water–methanol mixtures, Eur. Polym. J. 42 (2006) 1403–1416. T.J. Chou, A. Tanioka, Ionic behavior across charged membranes in methanol-water solutions. I: Membrane potential, J. Membr. Sci. 144 (1998) 275-284. T. Arfin, Rafiuddin, Transport studies of nickel arsenate membrane, J. Electroanal. Chem. 636 (2009) 113–122. A.A. Moya, Harmonic analysis in ideal ion-exchange membrane systems, Electro. Acta. 90 (2013) 1–11. M. Arsalan, M.M.A. Khan, Rafiuddin, A comparative study of theoretical, electrochemical and ionic transport through PVC based Cu3 (PO4)2 and polystyrene supported Ni3 (PO4)2 composite ion exchange porous membranes, Desalination 318 (2013) 97–106. U. Ishrat, Rafiuddin, Synthesis characterization and electrical properties of Titanium molybdate composite membrane, Desalination 286 (2012) 8–15. M. Arsalan, Rafiuddina, Synthesis, structural characterization, electrochemical, and electrical study of polystyrene based manganous tungstate composite cation exchange membrane, 52 (2014) 7531-7542. M.M.A Khan, Rafiuddin. Synthesis, characterization and electrochemical study of calcium phosphate ion exchange membrane, Desalination 272 (2011) 306–312. T. Teorell, An attempt to formulate a quantitative theory of membrane permeability, Proc. Soc. Exp. Biol. Med. 33 (1935) 282-285. K.H. Meyer, J.F. Sievers, La perméabilité des membranes I. Théorie de la perméabilité ionique, Helv. Chim. Acta. 19 (1936) 649-664. K.H. Meyer, J.F. Sievers, La perméabilité des membranes. II. Essais avec des membranes sélectives artificielles, Helv. Chim. Acta. 19 (1936) 665-677. I. Altug, M.L. Hair, Porous glass as an ionic membrane, J. Phys. Chem. 72 (1968) 599-603. N. Kamo, M. Oikawa, Y. Kobatake, Effective fixed charge density governing membrane phenomena. V. Reduced expression of permselectivity, J. Phys. Chem. 77 (1973) 92-95. M. Yuasa, Y. Kobatake, H. Fujita, Studies of membrane phenomena. VII. Effective charge densities of membrane, J. Phys. Chem. 72 (1968) 2871-2876. M. Tasaka, N. Aoki, Y. Kondo, Nagasawa M. Membrane potentials and electrolyte permeation velocities in charged membranes, J. Phys. Chem. 79 (1975) 1307-1314. M. Nagasawa, Y. Kobatake, The theory of membrane potential, J. Phys. Chem. 56 (1952) 1017-1024. T. Arfin, Electrochemical properties of titanium arsenate membrane, Electrochim. Acta. 54 (2009) 6928–6934. M.M.A. Khan, Rafiuddin, Synthesis, electrochemical characterization, antibacterial study and evaluation of fixed charge density of polystyrene based calcium-strontium phosphate composite membrane, Desalination 284 (2012) 200-206. M.N. Beg, F.A. Siddiqi, R. Shyam, I. Altaf, Studies with inorganic precipitate membranes: Part XXVI. Evaluation of membrane selectivity from electric potential and conductivity measurements, J. Electroanal. Chem. 98 (1978) 231-240. M.M.A. Khan, Rafiuddin, Inamuddin, Electrochemical characterization and transport properties of polyvinyl chloride based carboxy methyl cellulose Ce(IV) molybdophosphate composite cation exchange membrane, J. Ind. Eng. Chem. 18 (2012) 1391–1397. A. Canas, M.J. Ariza, J. Benavente, A comparison of electrochemical and electrokinetic parameters determined for cellophane membranes in contact with NaCl and NaNO3 solutions, J. Colloid Interf. Sci. 246 (2002) 150-156. ASTM D543-95, Standard particles for evaluating the resistance of plastics to chemical reagents, 1998, p. 27. A.A. Khan, S. Shaheen, U. Habiba, Synthesis and characterization of poly-oanisidine Sn (IV) tungstate: A new and novel ‘organic–inorganic’nano-composite material and its electro-analytical applications as Hg (II) ion-selective membrane electrode, J. Adv. Res. 3 (2012) 269-278. M. Arsalan, Rafiuddin, Fabrication, characterization, transportation of ions and antibacterial potential of polystyrene based Cu3(PO4)2/Ni3(PO4)2 composite membrane, J. Ind. Eng. Chem. 20 (2014) 3568–3577. Z.A. Siddiqi, M. Khalid, S. Kumar, M. Shahid, S. Noor, Antimicrobial and SOD activities of novel transition metal complexes of pyridine-2,6-dicarboxylic acid containing 4-picoline as auxiliary ligand, Eur. J. Med. Chem. 45 (2010) 264-269.
hexahydrate and nickel potassium phosphate hexahydrate, J. Mol. Struct. 834 (2006) 408–413. K.A. Shandi, F.A. Wedian, Estimation of composition, coordination model, and stability constant of some metal/phosphate complexes using spectral and potentiometric measurements, Chem. Pap. 63 (2009) 420–425. M. Arsalan, Rafiuddin, Binding nature of polystyrene and PVC 50:50% with CP and NP 50:50% ion exchangeable, mechanically and thermally stable membrane, J. Ind. Eng. Chem. 20 (2014) 3283–3291. F. Jabeen, Rafiuddin, Membrane potential and fixed charge density across TiPO4-VPO4 composite membranes for univalent electrolyte solution, J. Por. Mat. 16 (2009) 257-265. T. Arfin, A. Falch, R.J. Kriek, Evaluation of charge density and the theory for calculating membrane potential for a nano-composite nylon-6,6 nickel phosphate membrane, Phys. Chem. Chem. Phys. 14 (2012) 16760-16769. F. Jabeen, Rafiuddin, Transport studies with composite membrane by sol-gel method, J. Disp. Sci. Tech. 31 (2010) 1708–1713. F.A. Siddiqi, N. Lakshminarayanaiah, M.N. Beg, Studies with inorganic precipitate membranes. IV. 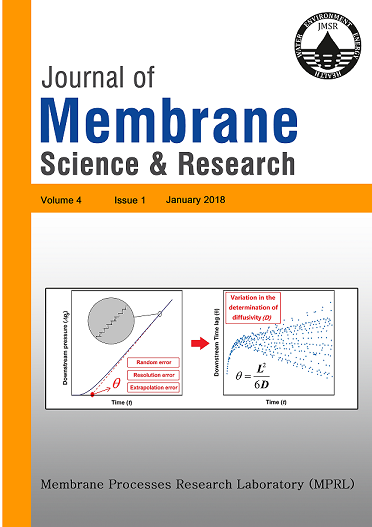 Evaluation of apparent fixed charge on membranes, J. Polym. Sci. 9 (1971) 2869–2875.